You are here: Home / Diary / If You Are a Cat, This Post Will Make You Really, Really Hungry! If You Are a Cat, This Post Will Make You Really, Really Hungry! I got a package in the mail and was thrilled when I saw the return address! My human had ordered some Grandma Lucy’s freeze-dried treats from Nip and Bones! That’s the store that belongs to my friend, Baby Patches. Oh yeah, and her human. I waited impatiently for my human to open it. She seemed to think it was more important to take photographs than let us have the treats. Sometimes her thinking is really warped. The liver treats looked crumbly, which meant they would be good to sprinkle on my food, but maybe not too good for the rug, so my human opened up the lamb treats. I decided to help myself. I confess I got a little out of control. The great thing about Grandma Lucy’s treats is that they are made out of freezed-dried meat without any of that junky stuff you find in most brands of cat treats. The only downside is that they tend to draw a crowd. There is one problem with the packaging, though — some humans think that the little cloth covers are cat bonnets. They are not. 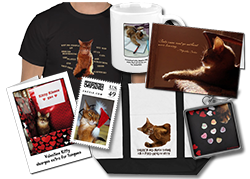 See all of Summer’s merch at her Designercat Shop, available on Zazzle. Hey, we got these for our World Cat Day treat…but don’t tell our mewmmie about the hat idea!! @Maxie Yay! I hope you love them as much as I do. As you can tell, they are a big hit here. Right again, Sparkle. I am HUNGRY now! Those do look yummy! We want to try them so bad and we’ve been trying to get Mommy to buy us some but she’s afraid of Isabella choking on them or something crazy like that because she doesn’t chew her food, she just swallows it. I have a solution, Isabella doesn’t need to eat any – I’ll eat them all! I just don’t know how you put up with your human’s screwed up priorities! Or there lack of respect – silly hat! Cool! We will try thos! Oh those sound yummy! We have had freeze dried chicken before but never lamb or liver – you are so lucky! But we do think that they need to not include a “cat bonnet” with each one – we can see our mom trying to put it on us or something! Hm… we think our tummies are rumbling now! Nom nom nom! Those treats look delicious!!! We love Nip and Bones! MOL, you does not look happeh about that bonnet. the treats look yummylicious though! We love Grandma Lucy’s freeze dried treats. Yes, the liver is very crumbly. We like the lamb a lot. Please tell your Mom not to give our Mom any ideas about making hats from the packaging. They look delish and our mom would think they’re little cat bonnets too! We feel your pain! This reminds me of the Yugoslavian restaurant I waited tables at in high school. The seniors would come in Wednesday afternoons and order liver and onions. Gawd, I hated Wednesday afternoons–old people smell mixed with liver and onions smell. Makes cat pee smell good! MOL….Those look nommy. As for the “bonnet,” you needs to whap it right under the sofa! We LOVE Grandma Lucy treats! They are pawsome. We hope our Mom doesn’t get any ideas about that cute little lid cover….. They look yummy! We’ve never had freeze dried treats, wonder if we’d like them? We bet they smell delicious. Even our human is hungry now…though not for freeze-dried liver or lamb. LOL. I don’t know if I would like those treats or not. My mom has tried some freeze dried stuff, but I turned up my nose to it. We think your bonnet is really cute sparkle. LOL, But we are sure going to check out those treats and get our assistant to get some of them for us. It looks like all of you really like them. Sparkle, we were gonna have our mom order those for us. Then we saw those jar covers and we knew they would end up on us like they did on you. So we changed our minds…. Nom, nom, nom! Our favorite treats, ever. We have not tried the lamb ones yet. Sometimes we get the crumbs from the bottom of the liver treats sprinkled on our foods! Oh Sparkle! Is your ‘snack fest’ sort of like the human equivalent of partying and ending up wearing a lampshade on your head? Sorry, but we had to laugh at that last photo!! We’re going to send Momma over to Nip and Bones though….since her Grandma was named Lucy I think she needs to get us some of those snacks!!! Stay up to date and get subscriber-only exclusives! 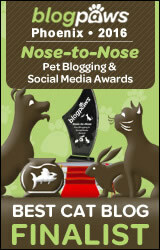 Get Summer’s Weekly Blog Post Updates! Know what Summer is blogging about every week. T-Shirts, cards, mugs and more! Is Your Cat Plotting to Kill You? What Kind of Cat Are You?